In this episode of the Memberium customer spotlight series, Brett Gilliland, the CEO of Elite Entrepreneurs walks us through how his company built and structured their membership site with Memberium. In addition to walking us through his membership site, Brett shares a ton of great advice that any business owner can use to grow their business. He also shares some useful tips on how to effectively structure your membership site’s content when you’re just launching the first version of your membership site and lots of other useful nuggets throughout this video. Who is Brett Gilliland and What is Elite Entrepreneurs? Brett spent 10 years helping Infusionsoft grow from $7M in revenue and about 80 people to over $100M and 500+ people. He helped Infusionsoft establish their Purpose, Values, and Mission and built the people and leadership systems to attract, hire and retain the right people. Brett helped co-create Infusionsoft’s “Elite Forum” with Clate Mask and helped build the Elite business inside of Infusionsoft. For over 6 years they taught hundreds of entrepreneurs how to successfully grow their 7-figure businesses to $10M and beyond. In 2018, Elite Entrepreneurs became its own standalone company. At this point what was lacking was a program for people who wanted access to the Elite Forum content but, for whatever reason, weren’t ready to attend a live event. This is where the idea for a membership site (and using Memberium) started. To be able to reach a wider range of people, they created a membership program that includes all of the materials from Elite Forum inside of a membership site that’s built with Memberium. This includes videos from a live Elite Forum event, access to all of the materials someone would get if they attended an Elite Forum event in person and access to the other training content they have available. Members also get access to Brett once a month to ask questions live via an Open Office Hours group call. Instead of only being accessible by attending a live event, this incredibly valuable Elite Forum content is now shared anytime, anywhere through a membership product that anyone can access. In this video, Brett shares how he structured the content inside of the membership site and how he decided on what content to include in the online program after running live events for so long. If you’ve been wondering how you can turn your live event business into some type of online membership program there’s a lot of useful knowledge shared throughout this video that you’ll be able to learn from. Over the years Elite Entrepreneurs has built up a ton of great content from all of their past events. 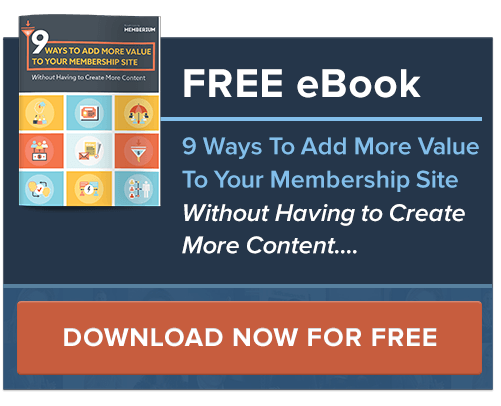 The value that members get from a membership site can only be delivered if they consume your site’s content. If they pay for your membership site month over month, and they’re not using anything, that’s problematic. Brett shares a few ways they tried to overcome this problem and engage their members month over month, in other ways besides them just being able to watch video content. They onboard new members by showing them a simple timeline that shows them the path they should be taking, month by month throughout their membership. This helps them understand what the membership site will help them accomplish and keeps them focused on what they should be doing at each stage of their membership over time. 1. Paint a picture of what members can expect to get from completing your membership program and guides them in moving forward. 2. A simple timeline also helps members quickly understand what they should be working on depending on how long they’ve been a member and lets them see where they’re at with their membership. Throughout this video, Brett gives his own advice for any business owner who’s considering starting their own membership site and shares some quick advice for any business owner who’s interested in further growing their business. Brett also shares some of the most common things he sees that hold entrepreneurs back from further scaling their business and some of the most common problems preventing them from growing.